The winter capsule is here! Well, phase one is here. I’m officially in my second trimester and expecting to have to switch pieces out for roomier/more maternity friendly ones. I update my wardrobe after Christmas anyway, but this time will be a little different since I have no idea how big my bump (and the rest of me) will get. When I first shared about my pregnancy a bunch of you expressed interest in seeing my maternity capsules so I didn’t want to completely skip creating a winter capsule wardrobe this year. I figured I’d show you what I’m currently working with, what I’m hoping to add, and what I expect to trade out as the weeks go by. I’ve hit my color scheme stride after two years of planning capsule wardrobes. Curating my closet has left me with items that are all my favorite colors to wear. 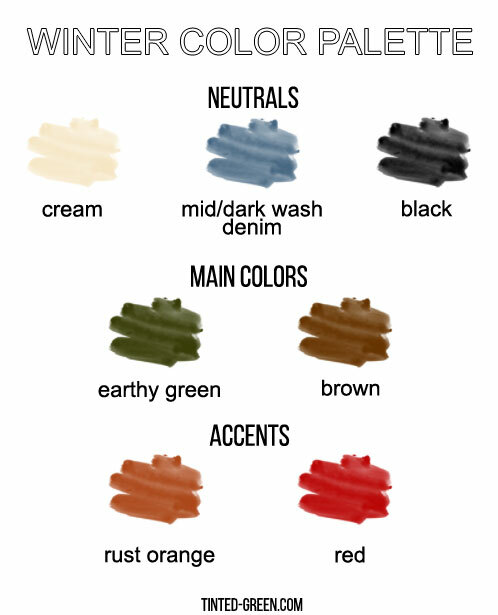 Here are the colors I’ll be working with this winter. Being pregnant means my coziness is my top priority. I’m talking soft fabrics and warm sweaters and flat shoes. I want to be sure cozy still looks put together, so I’ll be using scarves, earrings and socks to add those little styling details that really make it look like you tried (even if you didn’t really try). I might be crazy for this but I haven’t bought any maternity jeans yet. Working at Madewell means I have to wear Madewell jeans when I’m at work, so I’m saving up for a pair/hoping to get some for Christmas. In the meantime, I’ve survived in my non-maternity jeans by using a belly band and wearing longer tops. The belly band is a piece of elastic fabric that you wear over your jeans to help hide the fact that they’re unbuttoned/unzipped haha. But it works! It’s helped me feel like myself in my clothes, even if they don’t fit exactly how I’m used to. All that to say, maternity jeans are at the top of my list. The belly band has been wonderful so far but it’s not something I’ll be able to pull off once my bump really pops out. I’ve got my eye on some Madewell maternity jeans, partly because I need them for work and partly because I truly love my Madewell denim. I’m already itching to wear something other than jeans and I’ve been drawn to sweaters layered over jersey maxi dresses while searching for outfit inspiration on Pinterest. So dresses are definitely on the horizon. If you've been around for a while, you'll know this is weird for me, but I'm excited to see how my style changes! I’ve heard women turn into personal heaters while pregnant but that hasn’t happened for me yet. Basic long sleeve tees will help keep me warm and bonus! wearing them under sweaters means I have to wash my sweaters less often. Plus they cover the growing bump when I wear cropped sweaters. I’ve asked for some maternity sweaters from Gap (did you know they have a whole maternity line?!) so I can have some sweaters I know will fit me no matter how much my baby bump grows. I’ve recently gotten back into earrings thanks to a gift from Fossil. I’m looking to add some more statement earrings to help juj things up. I’m really into these at the moment. I’m completely speculating but I think I have a pretty good idea of what items won’t make it to the third trimester. I don’t expect any of my non-maternity jeans to make it to February. My shorter, more fitted sweaters, like the caramel crewneck and my all-time favorite green chunky knit sweater probably won’t make it either. Most of my button up shirts are very roomy so I’ll be surprised if they don’t make it through the winter. I haven’t given much thought to what I’ll do about jackets but I’m hoping I’ll be able to make my non-maternity jackets work through the coldest part of the winter. That's it for phase one of the winter capsule! I'll share my wardrobe updates as they happen. If you want to see how I wear my outfits day-to-day, follow me on instagram! I share my outfits pretty regularly over there.